Almost any workflow involves computing results, and that's what Mathematica does—from building a hedge-fund trading website or publishing interactive engineering textbooks, to developing embedded image-recognition algorithms or teaching calculus. Numerics of any precision, symbolics, or visualization—Mathematica is the ultimate computational tool, with systemwide technology to ensure reliability, ease of use, and performance. Use Mathematica computation directly, as the engine in an infrastructure, or integrated into a standalone application. 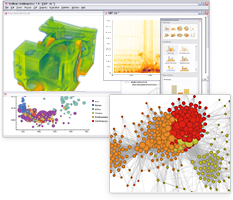 Develop tools, applications, documents, or infrastructure components using Mathematica's seamless workflow, unique symbolic language, and advanced code editing environment, achieving fast turnaround on small projects and record times on large systems. Whether your deliverables are interactive documents, presentations, applications, or enterprise systems, Mathematica can deploy your results in a wide range of formats locally or across a network. With many ways to connect to and work with external systems, Mathematica is designed to maximize your productivity.